With micro-resonators (fabricated in house or by collaborators) we are developing microcombs, integrated reference cavities and low-noise laser sources. The goal is to understand the fundamental and technical aspects for implementing precision time and frequency metrology in chip-scale devices. In the last few years a revolutionary paradigm for optical frequency combs and ultrastable continuous-wave lasers has emerged based on nonlinear optics in optical microresonators. Such microresonator devices can now be realized using millimeter-scale, chip-based photonic integrated circuits consuming low power and exhibiting reduced environmental sensitivity. Moreover, leveraging photonic integration realizes scalable devices that will enable new research directions both inside and outside the physics/metrology laboratory. Microresonator combs ("microcombs") are formed via parametric oscillation and four-wave mixing that initiates with only a CW pump and are enabled by advances in the quality factor (Q) and mode volume of microresonators. The usable frequency span of microcombs depends on low dispersion, making material properties critical, but this also makes possible operation in important new wavelength bands like the mid-infrared molecular "fingerprint" region. Moreover their repetition rates are in the unique 1-1000 GHz range to support applications ranging from telecommunications to astronomical spectrograph calibration. We realize microresonator CW lasers with ~1 Hz instantaneous linewidth via stimulated Brillouin scattering(SBS). Further stabilization with respect to a separate microresonator offers still improved performance and narrower linewidth. Here it is the very narrow band gain associated with the Brillouin mechanism and the low intrinsic noise of microresonators that drives outstanding performance for a chip-scale system. Stable lasers in a compact package would aid future ultraprecise sensors of time, fields, forces, etc., based on the interaction of light and matter. Our research at NIST leverages several photonic integration platforms to explore the basic physics of microcomb formation and to demonstrate future applications of these devices. The Figure below shows some of the resonator types that we use, including chip-based silicon-nitride microrings and fused-silica microdisks, and millimeter-scale, easy-to-fabricate fused-silica microrods. Over the last few years our NIST microdevice team has demonstrated several critical advances, including the first chip-scale optical clock and self-referenced microcomb, basic investigation of modelocking in microcomb systems, a chip-scale optical frequency reference with~50 Hz linewidth. Microresonator platforms utilized at NIST. 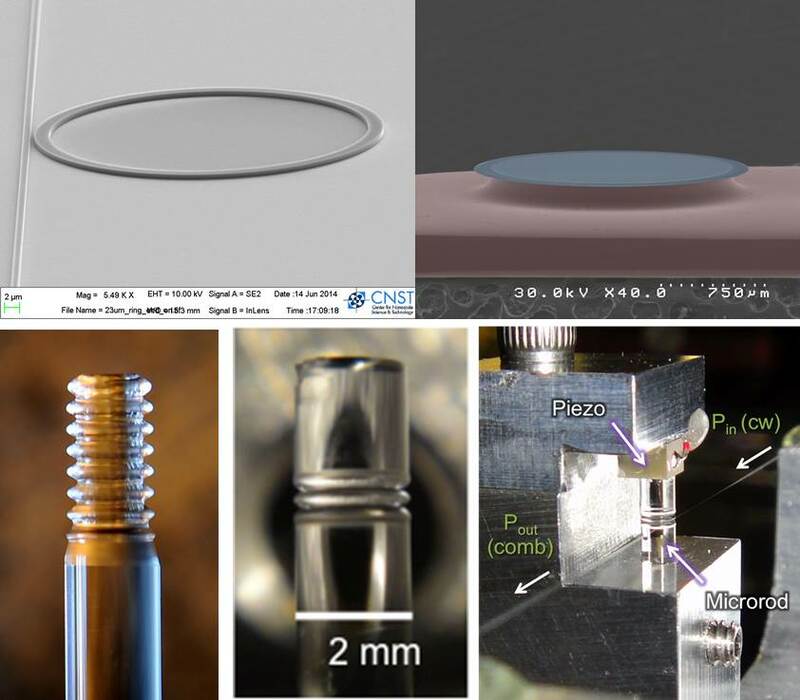 Starting at top left and reading clockwise: Silicon nitride microring resonator (courtesy Kartik Srinivasan, NIST-Gaithersburg), a fused silica microdisk (courtesy Kerry Vahala, Caltech), a NIST-Boulder microcomb system using microrod resonator, a CO2-laser machined microrod, and a flame polished microrod.